UM student smokers protest the new smoking ban on the rock last Friday. Juniors Micah Nellessen and Mason Schecter do not smoke. But at 2 p.m. Friday, they were sitting on the Rock’s steps proudly inhaling the secondhand smoke of the group of students who gathered to deliberately disobey the smoking ban on campus. 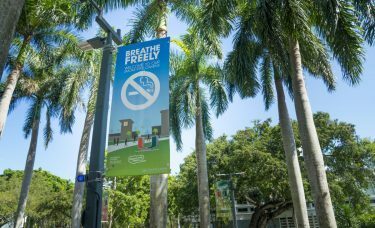 Student Government passed the Breathe Freely campaign two years ago after conducting a campus-wide poll. Last year, smoking was banned on campus except in designated smoking areas. There was an initiative to promote smoking cessation classes to students and faculty before the smoking ban went into effect at the start of this semester. Now that the campus is smoke-free, students looking for a quick drag must retreat to the sidewalks that border the school on Ponce de Leon Boulevard and Campo Sano Avenue because they are technically not on school property. 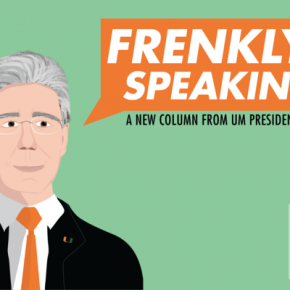 Students and faculty are responsible for enforcing the policy. The police department does not handle on-campus smoking. According to Arias, the first time a student is caught smoking on campus, he or she is given a warning. The second time they will be issued a written notice and sent to the Dean of Student’s Office. But according to Nellessen and Schecter, that self-policing plan has not been successful. “When I see someone smoking on campus now, it puts me in an awkward position to say something and I don’t,” sophomore Zoe Kafkes said. And to prove their point, Nellessen and Schecter and few of their friends who are not affiliated with any club or organization casually smoked their cigarettes in the middle of campus. They held signs stating their message, and even if some students were weary about the smoking, many signed the petition. In the one hour students smoked, no student or faculty member asked anyone to stop. However, there were a few faculty members who stopped by to sign the petition against the smoking ban. More than 500 people have signed it since Friday afternoon. Regardless of secondhand smoke and littering, the university is making a statement about the harmful effects of tobacco. 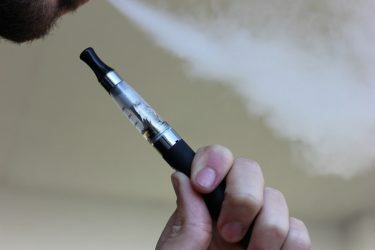 The ban of e-cigarettes has been particularly controversial as it exudes only water vapor. Nellessen and Schecter hope to collect enough signatures to meet with someone to talk about changing the policy.